While at the North American International Auto Show, Ford unveiled a bunch of items. They officially introduced Sync 3.0 – the newest version of their in-car computer system. But it was more about the cars, and Ford didn’t disappoint. First off was the Ford F-150 Raptor. This all-terrain truck with 3.5L EcoBoost V8 delivers 411 horsepower and over 400 ft. of torque. The Raptor is a little wider than the F-150 for stability. The best part is this truck will be built right in the new Ford truck plant right in Dearborn, MI. Next up – the Mustang Shelby GT350R. This car was stripped down enough to be street legal with a lot of creature comforts removed – including air conditioning. New Fiesta ST and Focus ST models were also shown, but it was more about the newest car in the line the company was really excited about. The Ford GT is the third generation of the GT series. The sportscar includes jackknife doors, bucket seats, Ford Sync and interestingly enough – an EcoBoost engine. The GT is a 3.5 liter twin-turbo V6 engine with over 600 horsepower. The car will go into production late this year and meant to compete in the 24 hours of Le Mans. It was a powerful start to the auto show. 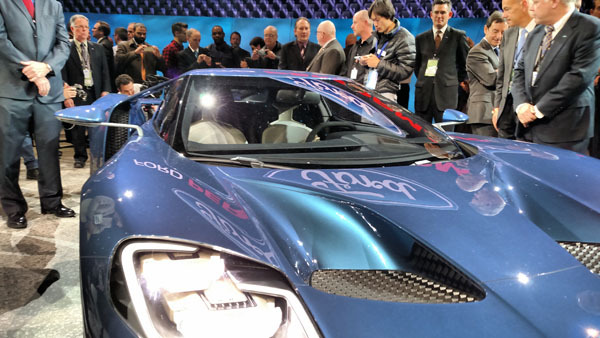 The video shows first looks of the vehicles, along with a couple sound bites from Bill Ford and president Mark Fields.